Kokoxili, a vast area of Tibet the size of Denmark and the Netherlands combined, is a unique landscape filled with beautiful lakes and freshwater wetlands that supports a distinct biodiversity and – historically – thousands of Tibetan nomads. 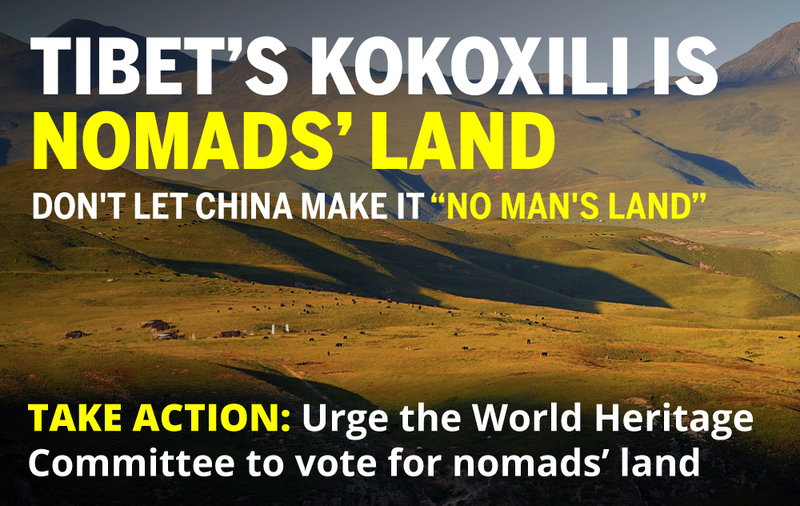 China, the country that has illegally occupied Tibet for over six decades, has nominated Kokoxili (Chinese: Hoh xil) for inscription on the UNESCO World Heritage List, calling it a “No Man’s Land”. To some it may seem like a positive step to protect this fragile area, but history tells us that this is not China’s plan. Approving Kokoxili as a UNESCO World Heritage Site, without a detailed survey of the impacts on Tibet’s nomadic people, would be tantamount to supporting China’s detrimental policies that remove Tibetan nomads from their traditional homelands, and give greater State control over Tibetans’ movements and lifestyle.